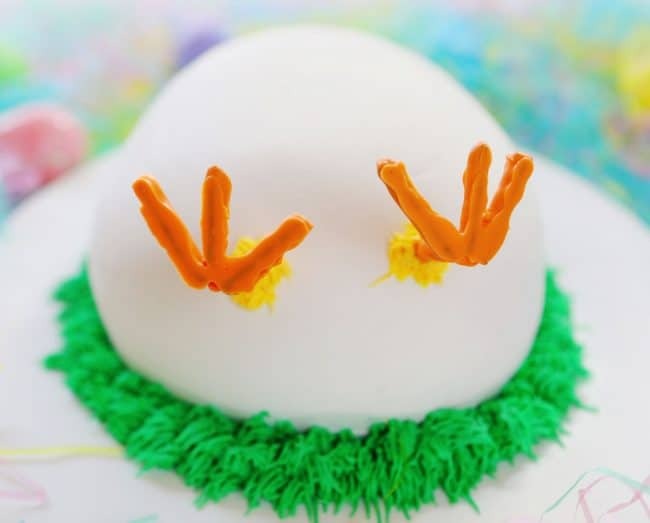 This Hatching Chick Cake is one of my favorite Easter Cake ideas yet! So easy to put together and so fun to share with friends and family! 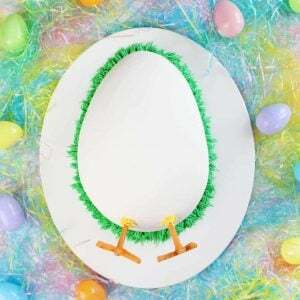 To make this cake you will need is TWO 9×13 yellow cakes, 1 batch vanilla buttercream, a few stick pretzels, a cut-out piece of paper shaped like an egg, orange candy wafers, yellow and green McCormick food coloring, and a pastry bag fitted with a #233 (grass) tip. Tools that come in handy are a large serving platter, a serrated knife, an offset spatula, parchment lined baking sheet, and two kitchen glasses. 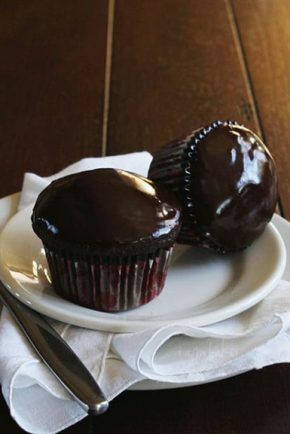 This cake can be made in a couple hours, but you will want to account for the chilling of the cake after crumb coating it and allowing the chocolate covered feet to fully harden before inserting into the cake. 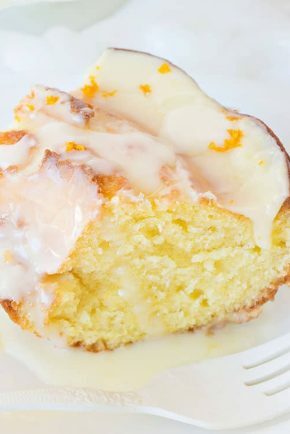 Bake two yellow cake recipes each in a 9×13 pan. 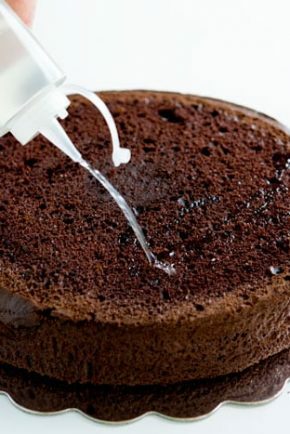 Allow cakes to cool to room temperature before assembling. Prepare buttercream. Tint 1 cup green and 1/4 cup yellow and place the green and yellow frosting each in a pastry bag fitted with a #233 tip. Set aside. Set one layer on your serving platter and cover in about 1 cup of vanilla buttercream. Set next cake layer on top. 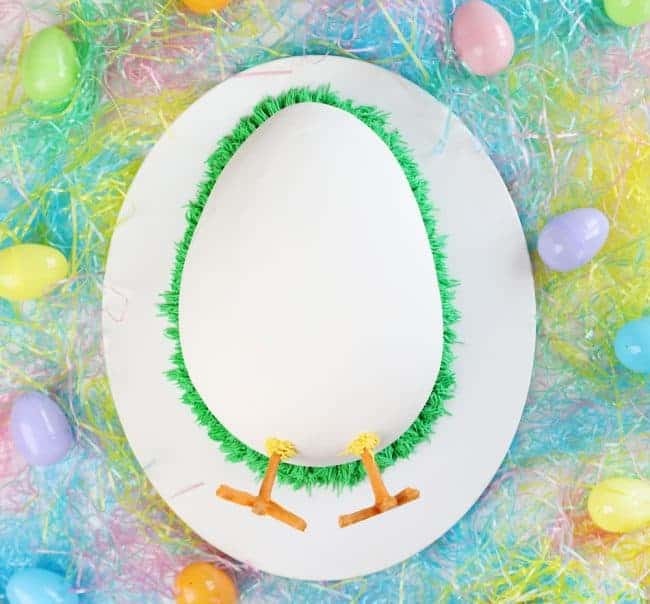 Place paper egg on top of cake and using a serrated knife, cut around the shape of the egg. Remove excess frosting. (You can use this to make mini cake pop eggs if you want!) Now carve a 3-D version of the egg. 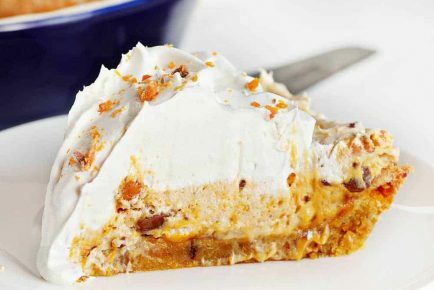 This will be removing sharp edges around the top and a tiny bit of cake from the very bottom. Once you have removed big piece you can go back in and fine-tune your shape. Stop periodically and stand back to make sure your egg is even and an oval shape. Cover the egg with buttercream. It can be easier to cover a chilled cake, so you may want to consider placing the egg in the refrigerator for a couple hours or in the freezer for 30 minutes. If you chill the cake you may not need to do a crumb coat. 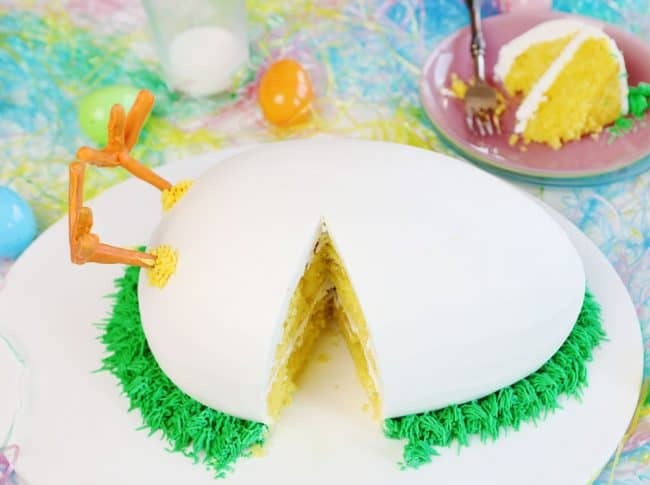 If you do not chill the cake, cover the egg with your crumb coat, chill the cake for a few minutes, then cover the egg with another beauty layer of frosting. I used a small offset spatula to smooth out the cake. Other methods are: using a paper towel on a chilled cake. 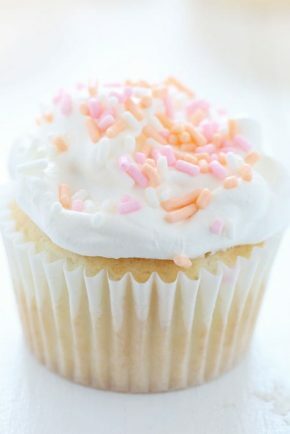 Simply press the paper towel over the chilled frosting and smooth out any lines. 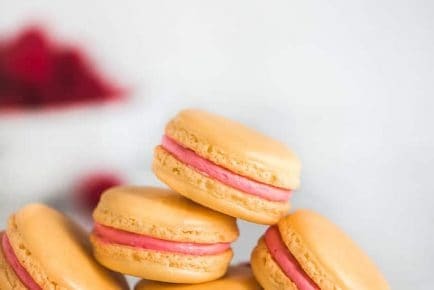 You can also do this with a piece of parchment paper and a fondant smoother. Grab a handful of stick pretzels and gently remove as much of the salt as you can. Prepare a sheet pan with parchment paper. Have 2 kitchen glasses ready. Melt orange candy melts until smooth. 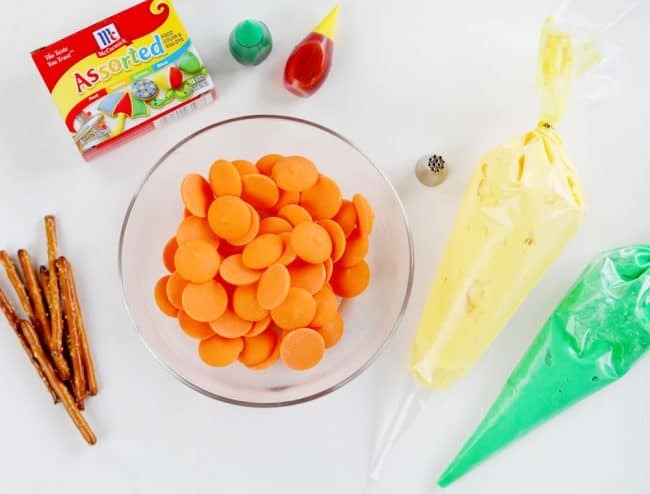 Break 3 of the pretzel sticks in half and then dip in the candy melts. With a fork, remove one stick and place on the parchment paper. Remove the next stick and place it next to the other stick creating a V. Remove the final stick and place it next to the v creating a W. You will want to make sure the tips of the sticks are touching at the base. Now take a full pretzel stick and dip it 2/3 into the candy melts. Set your kitchen glass at the base of the “W” (chicken foot) and then remove the stick and set it directly on top of the “W” (chicken foot) and then rest it against the kitchen glass. Repeat this so that you have 2 chicken feet. Allow the feet to set for at least 15 minutes before inserting into the cake. When you are ready to assemble the cake, simply find the spots that you want to insert the feet and mark with a toothpick. Then, just press the chicken into the cake! Grab your prepared yellow frosting and carefully pipe around the base of the chicken leg. 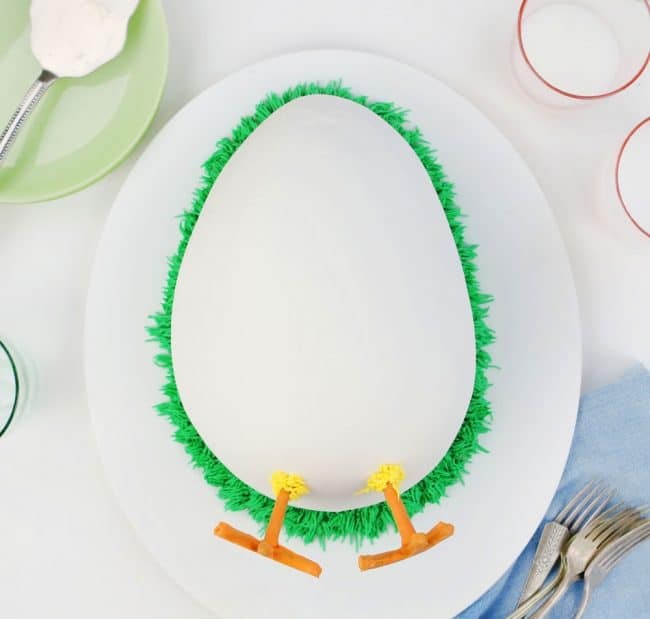 Get your prepared green frosting and start piping around the base of the chicken. In the video, I went around once but later decided to add more green grass. You can do as much or as little as you want! This cake is so simple to do yet is so exciting for everyone who sees it! And not to mention tastes great! Add milk, oil, vanilla, yellow food color, and eggs and mix on medium for one minute or until ingredients are fully incorporated. Pour batter into prepared 9 x 13 cake pan. Bake at 350°F for 22-32 minutes. Remove from oven and let cool in pan for about 5 minutes, then turn out onto a cooling rack for at least 30 minutes. Cool completely before frosting. Remember that you will want to DOUBLE the cake recipe and make TWO 9×13 yellow cakes. The recipe ingredients are for one cake.